Nurse, photographer, veterinarian. Detective, dentist, engineer. In the South Park Neighborhood Center, teenagers in the Duwamish Valley Youth Corps were talking about the jobs they planned to pursue. After eating dinner, they walked outside to learn about rain gardens. Later, they knocked on doors, carrying saplings for their neighbors to plant. When the teens are with Carmen Martinez, she knows their dreams are secure. When they’re not, she worries. “We’re trying to keep the kids active and safe,” said Martinez, a former shipyard worker and surrogate aunt to dozens of children in Seattle’s South Park neighborhood. Around 6:45 p.m. on Feb. 7, 16-year-old Dallas Esparza was fatally shot on 14th Avenue South amid a yearlong spasm of violence in the area. Two nights later, residents marched through South Park in silence to show support for each other, accompanied by Mayor Jenny Durkan and City Council members. The Seattle Police Department has stepped up patrols. City Hall is spending money on improvements, such as streetlights and crosswalk signals. But there are deeper needs. People under 18 make up 30 percent of South Park’s population, twice the city average, according to 2016 census estimates. 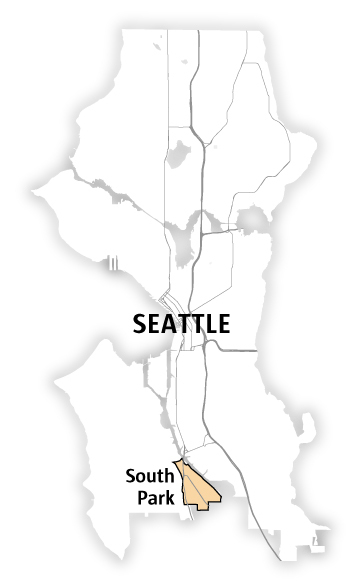 No other Seattle neighborhood is so young, with teens vulnerable to gangs and bullets fired from South Park and White Center to Burien and Federal Way. “Right now, we have some attention on us, but there are issues we haven’t resolved,” said Martinez, coordinator for the Youth Corps. 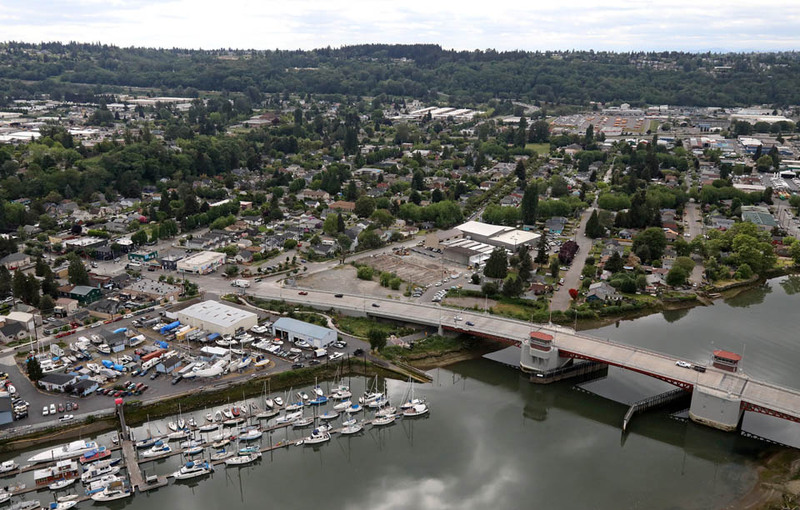 Wedged between highways, industrial land and the Duwamish River, South Park is an isolated neighborhood of about 4,000 with a history of surmounting discrimination and neglect. There’s no supermarket, no bank, no post office. The poverty rate is higher than the city average. But mom-and-pop stores and snug cottages lend the area a small-town atmosphere. In September, crowds line the streets for the annual Fiestas Patrias parade, with about 34 percent of the population identifying as Hispanic or Latino, according to 2016 census estimates. South Park residents have pushed for the valley’s polluted waterway to be restored and new businesses are popping up, including an event hall, a cafe and a brewery. On a sunny afternoon the neighborhood feels friendly and mellow, and people go about their daily routines. From 2012 through 2017, no one was killed by gunfire in South Park. Those attributes shouldn’t be obscured, Zugschwerdt said, by a recent uptick in shootings. After three reports of shots being fired in 2015, there were 21 in 2016 and 15 in 2017, plus five incidents in which people were hit by bullets. Three more shootings happened in January and February this year. Because shots are underreported and police only count reports confirmed by evidence such as shell casings, the true number was likely higher. “When you see an increase like that ... something has really changed,” said Marc Garth Green, assistant Seattle police chief for investigations. South Park is the youngest of Seattle's 53 neighborhoods, by percentage of residents under 18, and its community center has a larger teen budget than most. 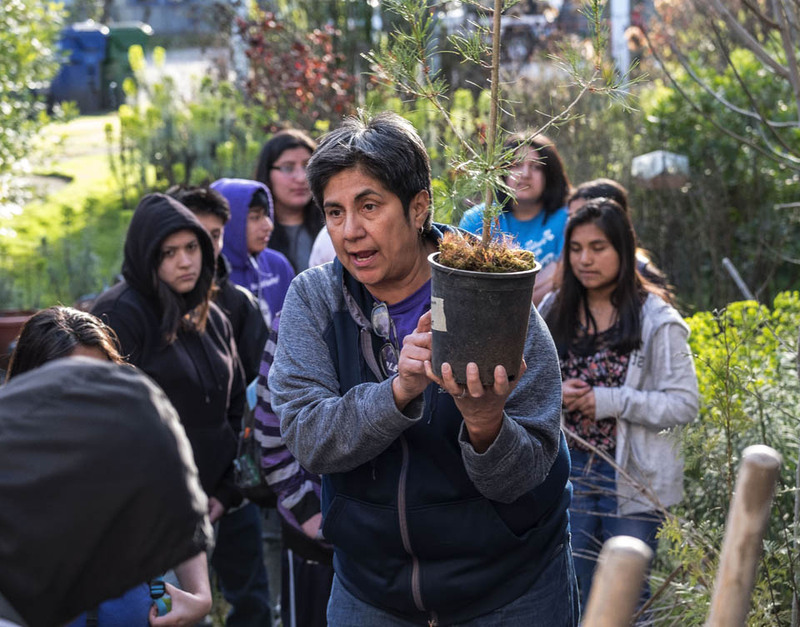 South Park’s air is less healthy than the air in leafier neighborhoods, so local teenagers are encouraging their neighbors to plant more trees. In recent years, South Park has seen increases in confirmed reports of shots fired and in shootings, with incidents concentrated in certain parts of the neighborhood. 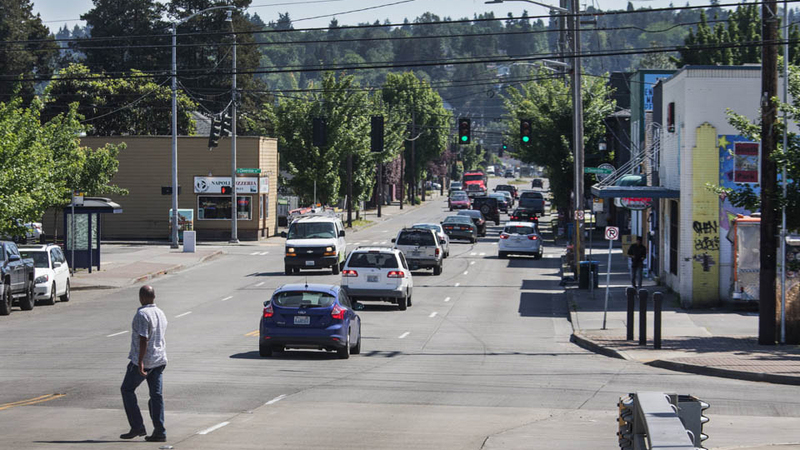 Seattle is spending nearly $1 million on projects meant to make South Park safer for pedestrians and more friendly in general. Several of last year’s shootings occurred at or near a house on South Donovan Street — a location mixed up in a beef among various gangs that has bled across city borders , Garth Green said. “We had some people staying down there and drawing violence,” he said, mentioning narcotics, territory and personal clashes as reasons. Linked in court records to fatal shootings in Federal Way and Burien in 2017, the gangs also may have been involved in the killings of two girls in Burien this March. Other Seattle neighborhoods, like the Central District and Rainier Beach, are also hot spots for gunshots. But South Park is closer to southwest King County cities, and disputes bleed across borders. 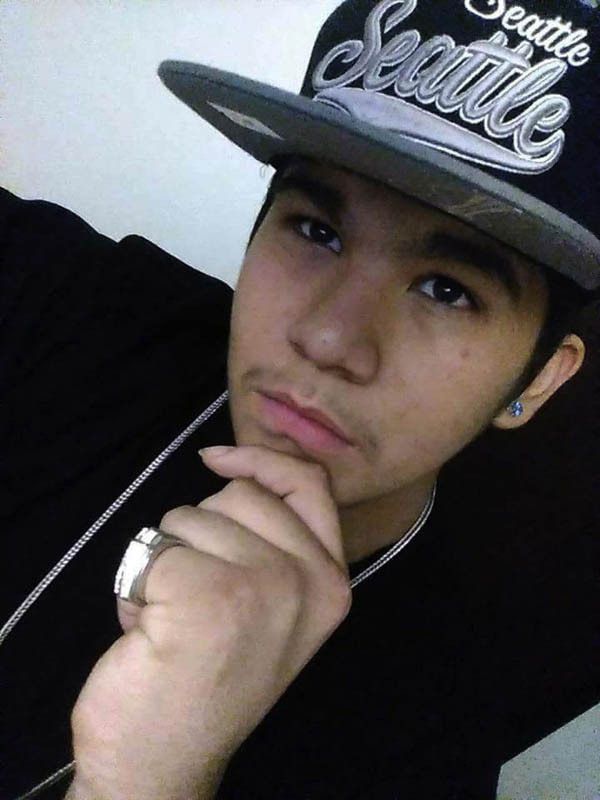 In April, county prosecutors charged five teens with conspiracy to commit murder for alleged roles in the fatal shooting of Erasmo Plata, describing the killing in Burien last year as retaliation by the United Lokotes against the Varrio Locos crew. “Let’s go to SP I’m trying to catch another duck,” one of the teens wrote in a Facebook message the same day as the killing, according to charging documents. That night, an alleged Varrio Locos member was shot at in South Park. More than 40 percent of the homicide victims across King County last year were under 25 years old. The Police Department carried out extra patrols in South Park last year, Garth Green said, doubling the number of officer-initiated calls in 2016. Garth Green declined to comment on Esparza’s killing — which remains under investigation — and whether it was gang-related. Police have made arrests related to the South Donovan Street incidents, he said. There were no more reports of shots fired from Feb. 19 through May 28 — a hopeful sign. You can see the gangs in South Park. Their tags are spray-painted on walls. “They’re claiming territory,” said 13-year-old Daniel Viles, who painted over graffiti with the Youths Corp this spring. You can sometimes hear the gangs, too, when their shots ring out at night, said Youth Corps participant Julissa Villa, who has trouble sleeping. At a time when mass shootings at schools are inspiring gun-safety activism, kids in neighborhoods like South Park have been living under threat. “My brother was outside on the grill and someone, like a gang member, came and put a gun toward his head,” remembered Julissa, 13. That brother has moved away from South Park, but Julissa’s father worries about his other children. “I tell the kids to stay home,” said Carlos Villa, who works as a janitor. Esparza died in the hospital. Whoever killed him must have thought he was a gang member — though he wasn’t, an older cousin said. They must have been looking for someone to hurt, said the cousin, who asked not to be named. The cousins were struggling when Esparza was killed — living without stable housing, he said. To relieve stress, they would talk for hours or drive to Alki Beach and watch the tide. The day of the shooting, Esparza went to spend time with his mother. Esparza’s mother, Charlene Kirkendall, said she wants Seattleites to honor her son by treating each other with care. Esparza was a happy, generous child who tried to protect her, she said. “Tell your kids you love them, because you don’t know from one minute to the next,” Kirkendall said. “Let’s go get the trees, baby!” Martinez whooped, jogging down the street in sneakers and sweatpants. 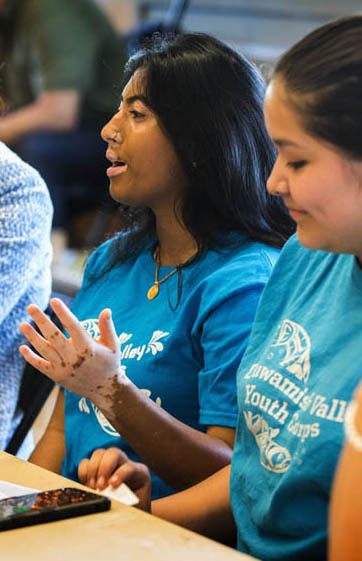 Founded in 2014, the Youth Corps is an environmental- and service-learning program. Martinez cracks jokes for the kids in a booming voice while director Paulina Lopez hunts for grants to keep the program running. Both women live in South Park. Each 12-week session, about 50 teens from the South Park, Georgetown and White Center areas receive stipends for their work. 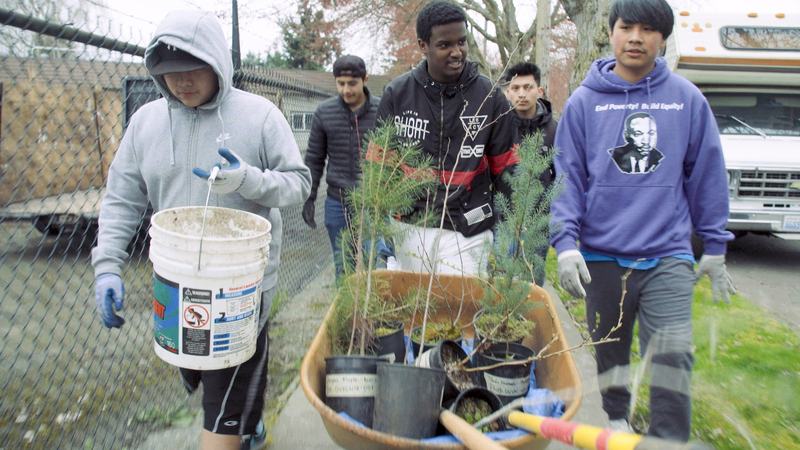 “We clean up the neighborhood,” said 16-year-old Roberto Reyna, explaining the air in semi-industrial South Park is more polluted than in greener parts of Seattle. Before pushing wheelbarrows of saplings down quiet streets, the teens met outside Martinez’s yellow bungalow for breakfast: bagels, bananas and Cinnamon Toast Crunch. They giggled as she showed them how to use a shovel, digging into the grass in her yard. Earlier in the spring, the teens had planted corn. “That’s the same concept I want you to have in your life,” Lopez said later, at a graduation party. She spoke in both English and Spanish to drive her point home. “The seeds you’re planting now are going to make the difference for your future,” she said. South Park residents describe the Youth Corps as a bright light in their neighborhood, with some graduates now college-bound. In March, the teens joined thousands in a march against gun violence downtown. But the program — with an annual budget of $180,000, including about $100,000 paid by the city — must regularly turn some kids away, Lopez said. 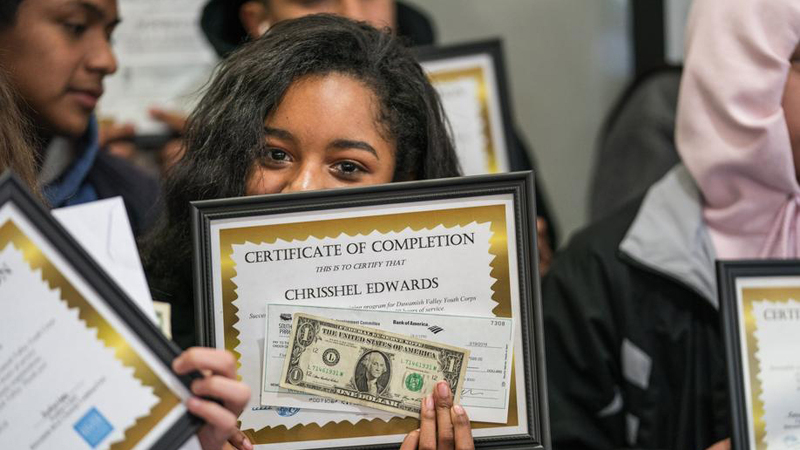 The city money is mostly reserved for first-time participants, so the program seeks private donations and other grants to serve the many teens who return. Some South Park kids from immigrant families lack documents such as Social Security cards, which can complicate funding. Hunger and homelessness can add pressure in an increasingly expensive city where many low-income families have been pushed to the margins. She believes programs must begin supporting children earlier, before middle school. Other organizations serve South Park kids on a shoestring, such as the Duwamish Rowing Club and the Squared Circle Boxing Gym. On the river, teens scull past rusty ships and junkyards. At the gym crammed inside an old house, Rihanna plays on the radio and sneakers squeak on the canvas. “Our membership is $55 a month, but as far as the youth, we don’t really stress them,” said Walter Wright, a boxer who trains there. Student essay: Cleaning up South Park started to change my heart. The police sponsor a number of sports and mentoring programs, realizing that putting teens behind bars will do little good in the long term. 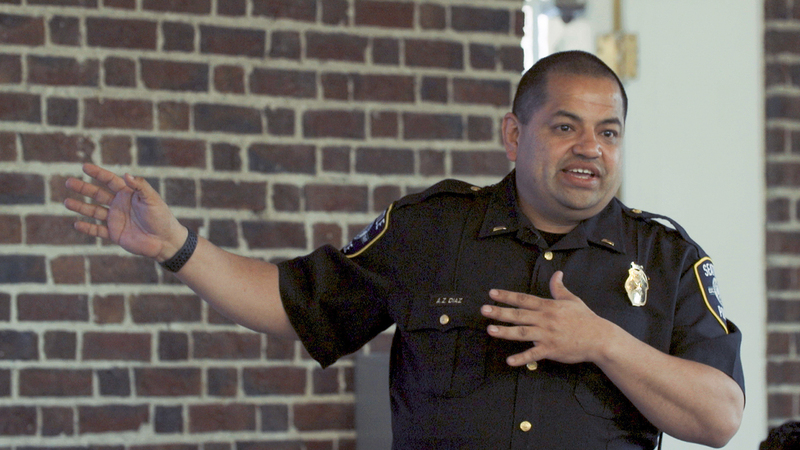 “Enforcing the law is not going to solve these issues,” said Lt. Adrian Diaz, a community-outreach cop who began working in South Park years ago. But the neighborhood has no YMCA, Boys & Girls Club or swimming pool. Teens rely on the bus to reach jobs and activities elsewhere, and only two routes pass through. For those reasons, residents say South Park’s community center should anchor the city’s attempts to serve local children. Martinez worked there until 2014, when she was fired and fined, in part for using city information to secure funding for a private youth baseball program run by her and her uncle. The center had been gutted by cuts during the economic recession. The South Park center has more money for teen work than most other centers and will host several programs for kids this summer, including ballet and soccer classes and internships. Building renovations are underway and the center’s sprawling playfield is being considered for a $4.1 million upgrade. The demand is substantial. The center saw 139,000 visits last year and averaged 63 teens at its late-night program, up from 28 in 2014. Still, its overall budget remains smaller than before the recession-era cuts, and many of the classes for kids charge fees. 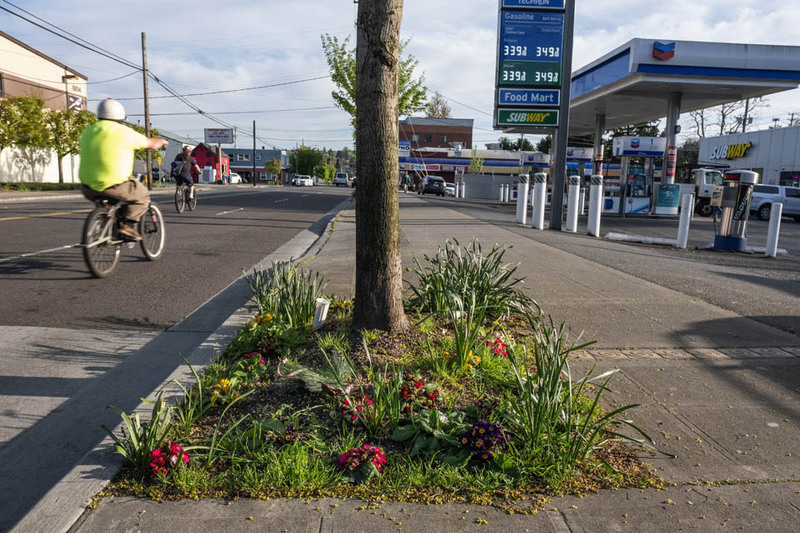 More than a year ago, Councilmembers Lisa Herbold and M. Lorena González recommended Seattle convene a task force on public safety in South Park, which in September made recommendations for streets, youth programs and other assistance. They put money behind the effort in November, including $75,000 for a neighborhood-safety coordinator. The city will spend nearly $1 million this year on streetscape improvements, and the Department of Neighborhoods has been asking residents to help choose the projects. “How many of you catch the bus and walk home and it’s really dark?” a Neighborhoods worker asked the Youth Corps teens, as hands sprang up. Durkan invited the Youth Corps to a town hall on gun violence in March. Last month, she announcedthe community center’s Friday late-night program would expand to Saturday nights through September. “I’ve heard your concerns,” Durkan said. Herbold hailed the change as overdue, and many residents welcome the attention. “We have to show this is a place for families,” said Victor Sandoval, who runs a fruit store on the block where Esparza was shot. Yet there are reasons to be wary. South Park home prices are starting to soar just in time for the infrastructure improvements, prompting concerns about gentrification. Others will judge the effort by how long it lasts. What makes Esparza’s death harder to bear is that “We’ve been through this before,” Martinez said. When 16-year-old Fernando Esqueda was gunned down in South Park in 2005, there were emotional meetings. Community members drew up an action plan, the city made short-term investments and the situation improved. Then Seattle moved on. Staff reporter Justin Mayo and news researcher Miyoko Wolf contributed to this article.